You can create printable tests and worksheets from these Health and Medicine questions! Select one or more questions using the checkboxes above each question. Then click the add selected questions to a test button before moving to another page. organisms so small they can only be seen with a microscope. Which organism has a prokaryotic cell? Which statement is true about a virus? They do not have a nucleus or organelles. They do not have a cell membrane. Microorganisms are too tiny to see with the naked eye, so we must use to see them. Unicellular organisms contain many cells. Bacteria come in three shapes: rod-shaped, ball-shaped, or corkscrew-shaped. Which vitamin, often found in citrus fruit, is also known as ascorbic acid? Which description is not a characteristic of bacteria? A microorganism can only be seen using a microscope. 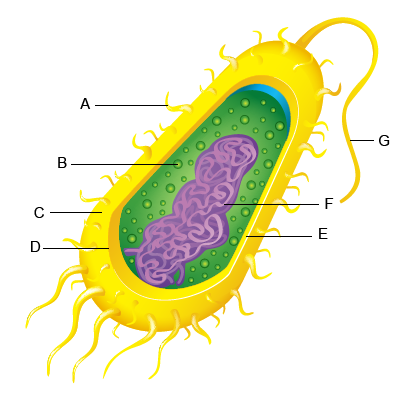 What type of a cell is shown in this unicellular organism?